Today was quite a day, wasn't it? Let's review. - We got our first meaningful taste of ReedPOP's influence on ECCC: the Showclix virtual queue, the new rules against resales and refunds, the opacity regarding the number of tickets per category, etc. Are veteran attendees resenting it? I saw a few bitter comments on Twitter but overall it's too soon to tell. 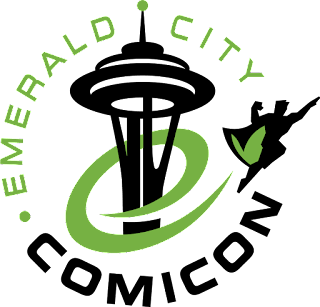 - We had our first nerve-wracking Emerald City sale. At least, it was nerve-wracking for me. I got a weird message twice between the "Buy Your Tickets Now" button and the queue, and I thought, Oh no, it's started: all the chaos and meltdowns of an SDCC-level sale. But then I got in and found myself in the queue, which I was used to from NYCC sales. I felt fairly confident but was still relieved to process through in about 5 minutes. - The hotel situation was odd. I disliked the way ECCC was having the hotels and tickets go live at the same time, so I poked around a bit early. Sure enough, hotels went live ahead of time, letting me book the Sheraton before the ticket sale launched. However, in just minutes of getting my ticket, I could see the Sheraton and other big hotels were already sold out on Wednesday night - which was a bitter pill for those attendees who had just completed their ticket sale and now needed a hotel for 4 nights. Thursday nights started selling out after that. What happened there? I'm guessing the team booked more weekend nights than Weds and Thursday. At any rate, more nights seemed to be added but we still have several completely sold-out hotels. - 4-day tickets went immediately, then Celebrity a few hours later, then Special Access. That's reverse order of how it went last year. Maybe Special Access (200 this year, 150 dollars last year) was priced too high for what it offered? It's also possible ECCC didn't offer as many 4-day tickets as 3-day. But I'm guessing 3-day will go pretty quick too. - I said a few posts ago that I thought 4-days would go fast, but "not in 5 minutes." Well, I was technically correct but only by the thinnest of margins; they sold out in 50. That's looking very close to a NYCC or SDCC sale. That's looking like an ugly 2017 sale. - A lot of ECCC attendees are clearly still operating in "local Con" mode and not competitively monitoring the news and updates. I say that because a number only knew the hotels and badges went live after ECCC sent out an email - which I like many others received in my spam folder 19 minutes after the sale started. A lot of those people came up short. So here's the unwelcome reality for Seattle attendees: the world has found your community Con and its bureaucracy will be never be relaxed or easy again. Superfans are too aggressive. ECCC is too popular. - All of the guest announcements got everyone excited today, but the timing was curious. Why did so many things have to roll out today? Normally I'd sense a press trigger or controlled spike, but I don't see what the point would be here. At any rate, we found out Nathan Fillion, Fiona Staples, Faith Erin Hicks, Sean Gordon Murphy and others shall grace ECCC next April. I think it's clear that the 2016 guests - both comic and Hollywood - are going to be legendary this year. - The rapid consumption of 4 day and VIP tickets could suggest simply that people were anxious; but I'm guessing that there's a much greater number of outsiders this year. Between ReedPOP buying ECCC, its growing reputation as a top Con, and the horrorshow that was this year's San Diego Comic-Con badge sale, I think a lot of first-timers are flocking to Emerald City for 2016. Tickets: Only 3-day and single day badges are left. Last year ECCC let us know when particular types were close to selling out but I don't know if they'll do that this year. Things feel a little less transparent. Hotels: The Grand Hyatt, Paramount and Homewood Suites are entirely sold out. The Westin and W still have Wednesday night, but most other hotels have only weekend availability or Thursday and weekend. This is actually more dire than the ticket sale in my opinion, because right now anyone can still buy all 4 days of the Con - they just might not have a place to sleep the night before. Hope you all got the badges and rooms you wanted. ETA: The Sheraton had more Wednesday nights added - so go back in and book if you couldn't get a Wednesday room yesterday. If you're new to ECCC, this hotel is right next to the convention center and worth paying an extra 30 a night or whatever compared to the cheaper hotels.